In the previous Saturday Supplement, I presented a round-up of Cup North, Manchester’s two-day coffee festival. This week I dive into the weekend in more detail. I could easily publish my adventures over five different Saturday Supplements, but at that rate, we’d soon be at Christmas, so I’ve decided to split it into two posts, with five main themes: Old Friends, New Roasters, Coffee Cuppings, Miscellaneous & Street Food. Part I, this post, includes Old Friends & New Roasters, while Part II, out next weekend, will have Coffee Cuppings, Miscellaneous & Street Food. Old Friends covers a pair of roasters I’ve previously visited and one roasters I’ve never met, but whose coffee I’ve been drinking for a while now. This particular roaster also roasts some of my all-time favourite espresso blends. In contrast, New Roasters covers (some) of the roasters that I ran into the first time at Cup North. Completely by accident, they were all from either Yorkshire (three) or Lancashire (two). The two sections have their own galleries and each has a short write-up as well. You can see what I got up to after the Old Friends gallery below. I’ll start off Old Friends with some new friends, the wonderful folk at TAKK who were there in force. Somehow I managed to miss that they were offering the chance to sample the constituent parts of their house-espresso, NorthProjekt, roasted for them by old friends, Clifton Coffee Company (see, I got there in the end!) who’d come all the way from Bristol. I also got thrown by another old friend, Chris, of Small St Espresso, who was moonlighting for Clifton, which was sharing the stand with TAKK. As well as getting Lisa to make me some coffee, she also took the chance to bend my ear about her coffee festival, the appropriately-named Glasgow Coffee Festival, coming to Glasgow on 6th December. Finally in the old friends category is Grumpy Mule, who I’d never actually met before, but who roast some of my favourite espresso blends. I was really pleased to catch up with them and meet Howard, one of the roasters. Grumpy Mule was running a competition to make the “perfect” cup of coffee. This involved choosing your coffee and preparation method (V60, Aeropress, Chemex or Cafetiere) and then making the coffee. Grumpy Mule provided scales, hot water and a grinder, plus advice, if you wanted it. The “perfect” element came in the form of a TDS (total dissolved solids) meter which (in theory) can tell you whether you’ve over- or under- extracted your coffee, with a “perfect” score indicating the optimum extraction. It was all a bit tongue-in-cheek since the ultimate test of the perfect cup of coffee is how it tastes! You can see how I got on in the gallery; all I’m saying here is that I didn’t win. (For those who are interested, my non-winning recipe was 15g of Kenyan Nyeri Ngandu AA Washed, 225g of water, inverted Aeropress, 90 seconds brewing and 20 second plunge, all of which resulted in a TDS of 1.41. And yes, it tasted great!). I started off by tracking down Hope & Glory from Hull, where I caught up with Gina, Rebekah and Sean, who had been good enough to send me some of their Mad Hatter espresso blend earlier in the year. Rebekah made me a V60 of the Cerro de Jesus from Nicaragua which was a lovely sweet and fruity cup. I also got a bag of the Ethiopian Qorema to take home with me. I paid a visit to Sheffield roasters, Foundry, where I was drawn to the lovely Londinium lever espresso machine. I was well looked after by Lee & Callum with Callum pulling me a shot of an Ethiopian Yirgacheffe natural which was just out of this world. It had a syrupy mouth-feel and an incredibly sweet, smooth taste. Callum pulled it a little but longer than your traditional third-wave barista, but whatever magic he was weaving, it was excellent. I also tried the same coffee through the Aeropress. To be honest, it was a good cup of coffee, but nowhere near as impressive as the espresso, lacking the wow factor. Next up was Passion Fruit Coffee, one of the Manchester micro-roasters, who along with Ancoats, Coffee Circle and ManCoCo, produced the bespoke Cup North espresso blend (which is phenomenal by the way!). I tried another Yirgacheffe, this one a Dumerso natural, which, while I liked, was much more acidic and not as sweet as Foundry’s. The fascinating thing I discovered about Passion Fruit is that Shen, the owner, is roasting on a 1920s Whitmee open-flame roaster, making her one of only three roasters in the country using a Whitmee. Moving back across the Pennines, I tracked down the Bean Brothers from Huddersfield. I met both of the brothers, James and Jeremy, who perhaps have the best logo ever (although that might be my beard talking). They roast their own espresso-blend, which goes by the interesting name of Derek, but perhaps more interestingly, they make an espresso stout. Regularly readers will know that I am not a great alcohol drinker and certainly not a beer drinker, but this was something else and I heartily recommend it! Finally, I close with J Atkinson & Co, from Lancaster, which has been going since 1837! It’s still very much a family affair, although the business passed out of the hands of the Atkinson family back in 1960. 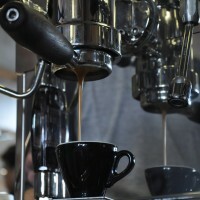 The current owners brought along a restored, 1960s Faema E61 lever espresso machine. It really was a weekend for lever machines! Naturally I was drawn to this lovely beast. I was also impressed to learn that J Atkinson roasts all its own coffee on a pair of Whitmee open-flame roasters. How amazing is that? We had two of the three roasters in the country who use Whitmee only-flame roasters in the same hall (the third, by the way, is Newcastle’s Pumphrey’s Coffee). Of course, I had to have an espresso from the Faema, which proved to be a fitting way to end Cup North!